CLPHA experts welcome interview requests from print, radio, television, and online reporters and are happy to provide their insights on issues of public housing and related legislation and policy. *Please let us know if you are working on deadline. You can subscribe here to our biweekly newsletter, events invite list, and topic specific newsletters. You can also follow us on Twitter at @CLPHA. Or send us an email with your interests and we would be happy to add you to our press lists. Thanks again for your interest in CLPHA! Washington, DC – The Council of Large Public Housing Authorities (CLPHA), a housing advocacy organization and leader in the effort to improve life outcomes for low-income individuals and families, continues its commitment to systems alignment work by unveiling theHousing Is initiative, including a new online resource to help enhance and strengthen its community of practice. Thanks to generous funding from the Bill and Melinda Gates Foundation, the John D. and Catherine T. MacArthur Foundation and the Kresge Foundation, on February 7,CLPHA introduced www.HousingIs.org, an online clearinghouse to support cross-sector collaboration. Stable housing provides the foundation for increased success in other areas of life, including education and health. CLPHA has been instrumental in amplifying the call to improve coordination between sectors, creating more opportunities for individuals and families. “The clearinghouse at www.HousingIs.org will be a place professionals can go to tap into innovative ideas and connect with other forward-thinking practitioners,” said CLPHA Executive Director Sunia Zaterman. Together with housers, researchers, health professionals, educators, policymakers and community leaders, CLPHA and its member housing authorities have been working to create and strengthen cross-sector partnerships, promote best practices, share critical data, host convenings, and improve the policies and practices that directly impact low-income residents and the homeless. Improving the lives of the most vulnerable is most effective when sectors break down silos and work together. The Housing Is clearinghouse will be a hub for promoting effective programs and sharing innovative ideas, and it will facilitate coordination between the experts who work within various support systems. The website was designed to support the overall Housing Is initiative by promoting collaboration, expanding partnerships, and serving as a virtual gathering place for a rapidly expanding community of practice. While collaboration among systems that individuals access is vital, partnerships are not always easy to establish. CLPHA’s Housing Isinitiative demonstrates how housers have deep connections to children and families in ways that other systems do not, and how providing collaborative tools for creating and strengthening partnerships can reduce costs and increase effectiveness. CLPHA and its members have already been working across sectors to improve life outcomes for individuals and families. Among many others, the Vancouver Housing Authority and Vancouver Public Schools collaborated to identify joint goals while working to address challenges for low-income and homeless students. Because of this work, their partnership has reduced costs and improved effectiveness in areas such as chronic absenteeism. The online clearinghouse allows users to access and broadly disseminate research on existing challenges and opportunities, as well as promising and best practices. The site aids professionals in peer-to-peer learning and community data sharing, with space to highlight elements of successful partnerships, case studies on thriving efforts, and on-the-ground examples to scale and replicate. Users create an individual profile that outlines their professional experience and expertise. Once they’ve established a profile, users can join and create communities based on specific issues, topics or regions, and connect with other experts. Existing members of our community of practice—and those who have yet to join—can share resources, such as reports, articles and research, all within one site that offers collaborative tools. To learn more about the Housing Is initiative, and to join the community of practice through the online clearinghouse, please visitwww.HousingIs.org and register to create your own profile. U.S. Senator Robert Menendez (D-NJ) is leading an effort in the Senate to boost FY20 funding for public housing. His office has asked CLPHA for help in encouraging other Senators to sign onto the letter to the Appropriations Committee requesting full funding of the Public Housing Operating Fund at 100 percent proration, $5 billion for the Public Housing Capital Fund, and $200 million for the Choice Neighborhoods program. On March 14, the National Low Income Housing Coalition (NLIHC) released their annual report The Gap: A Shortage of Affordable Homes. The report finds concrete evidence of an affordable housing crisis: there is a shortage of seven million (or fewer than 4 for every 10) affordable and available rental homes for extremely low-income renters. Furthermore, no state or major metropolitan area has enough rental housing for the nation’s lowest-income individuals and families. Earlier this week, we called on CLPHA members to contact your members of Congress and register your opposition to HUD’s proposed changes to the Annual Contributions Contract (ACC). "Where towering, ominous public housing buildings once stood there is now the start of an inviting and friendly community of homes. On Tuesday, Mayor Steve Fulop, with the Jersey City Housing Authority (JCHA) and The Michaels Organization, unveiled the first 21 of 126 units of Mill Creek Gardens, on the site of the Montgomery Gardens public housing complex. The remaining units will be available in phases over the next two months as construction is completed. Of the 126-mixed income units, Mill Creek Gardens will offer 121 modern affordable housing units to working families." Read NJ.com's article “New affordable housing springs at old Montgomery Gardens site,” featuring the Jersey City Housing Authority. 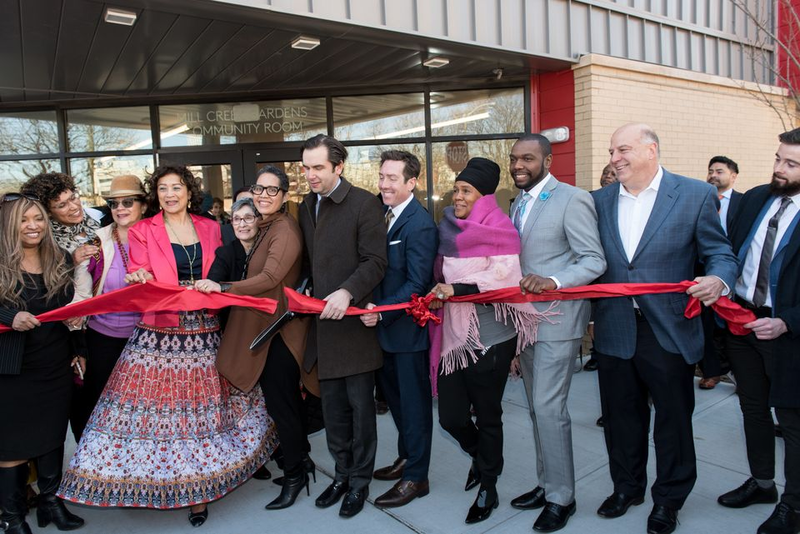 Jersey City Mayor Steve Fulop, representatives from the Jersey City Housing Authority, and other officials cut the ribbon at Mill Creek Gardens. Education Dive Magazine took an in-depth look at the innovative partnership between the Tacoma Housing Authority (THA) and Tacoma Public Schools (TPS). The program offers housing assistance to low-income families in order to enable children to stay in their same schools from year to year, thereby stabilizing students' attendance and improving their educational outcomes. The partnership, now known as the Elementary School Housing Assistance Program (ESHAP), began at Tacoma's McCarver Elementary School in 2011 and has since expanded to several schools in the Tacoma area. The program has helped more than 150 children stay in their schools so far. A 2017 evaluation of the program at McCarver found that students in the program experienced a 23.3% turnover rate -- significantly lower than the school district's 57% average turnover rate for elementary schools. The evaluation also showed that 68.8% of the program's students were reading at grade level, up from 35.8% at the program's inception. Read Education Dive's article to learn about the history, evolution, and future of THA and TPS's impactful program. CLPHA's Housing Is Initiative's 2018 publication "Up and Down the I-5 Corridor: How Housing Authorities in the Pacific-Northwest Created a Regional Collaboration to Further Housing-Education Efforts," funded by the MacArthur Foundation, discussed THA and TPS's innovative McCarver Elementary School program and outlined elements of successful partnerships between housing authorities, local school districts, and other regional partners. Click here to read the publication. Minneapolis is launching its most aggressive effort yet to help homeless students succeed in school at a time when homelessness in Minnesota is at a record high. The new Stable Homes, Stable Schools pilot program, believed to be the first of its kind in the nation, will provide rental assistance and intensive social services to the families of about 650 students in Minneapolis Public Schools over the next three years. Officials plan to house the first group of families next month. The program involves the city, school district, county and the Minneapolis Public Housing Authority and is a key initiative for Minneapolis Mayor Jacob Frey, who has stressed the need for affordable housing — the lack of which has a particularly devastating impact on schoolchildren, research shows. Read the Star Tribune's article “In Minneapolis, a bold plan to help homeless schoolchildren takes shape,” featuring the Minneapolis Public Housing Authority. The Denver Housing Authority is committed to helping vulnerable homeowners avoid displacement. The Authority's West Denver Renaissance Collaborative has launched a pilot program to make sure residents in nine west Denver neighborhoods can benefit from the renaissance underway in that part of the city. Read Denver7's article "Denver finds creative way to bring stability to vulnerable homeowners, affordable option for renters," featuring the Denver Housing Authority. The New York City Department of Housing Preservation and Development (HPD) and the New York City Housing Authority (NYCHA) has selected two separate groups to develop two 100 percent affordable senior housing communities in the Bronx and Brooklyn, N.Y. Xenolith Partners, The Kretchmer Cos., ELH Mgmt. and the Jewish Association Serving the Aging (JASA) have been chosen to develop the Bronx project, while Blue Sea Development Co. and Gilbane Development Co. have been selected to develop the Brooklyn project. Read Multi-Housing News' article “New Affordable Senior Housing Coming to Bronx, Brooklyn,” featuring the New York City Department of Housing Preservation and Development and the New York City Housing Authority.